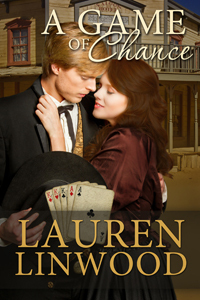 Today's featured book is A Game of Chance by Lauren Linwood. Gambler Jed Stone journeys to California to track down Simon Morgan, the man responsible for his best friend's death. Arrested for robbery and murder upon arrival, Jed is shocked to see his face on a wanted poster. He escapes before his hanging, unaware that the man guilty of those crimes is the twin brother he never knew existed. In a case of mistaken identity, Jed acquires the most famous whorehouse in San Francisco in a rigged card game his twin is meant to win. Lily Frontiere takes over running Lucky Lil's from her dying mother, the house madam who shielded her by sending her away to boarding school. Lily's intelligence and astonishing resemblance to her mother help in her charade, but she's entered a world she knows little about. She clashes with the handsome stranger who turns up with the deed to Lucky Lil's in hand, yet she is attracted to the charming risk taker. But Simon Morgan seeks both Lily's hand and ownership of Lucky Lil's—and he will go to any means to possess both. Will Jed foil his nemesis while bringing his outlaw brother to justice and win Lily's love? Lauren's historical romances use history as a backdrop to place her characters in extraordinary circumstances, where their intense desire for one another grows into the treasured gift of love. Her romantic suspense novels feature strong heroes and heroines who unite to defeat a clever antagonist and discover a deep, abiding love during their journey. Thanks for featuring Jed & Lily today, Kayelle!